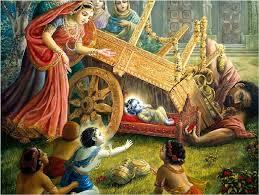 In the previous post we saw how krishNa was already winning over the many demons, when he was just a small baby. 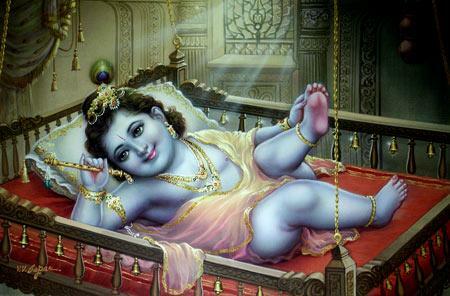 Sometimes one would wonder if krishNa ever acted like a baby, given that He was the parmAthma himself. krishNa with his leelais has always enchanted jIvAthmAs for generations. After the incident with chakatAsura, life was back to normal in gOkula. yashOdha and nandhagOpa were enjoying krishNa, along with balarAma and rohiNi dEvi. 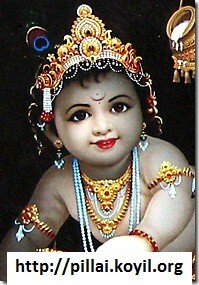 krishNa was growing well, starting to crawl and play with things around, knocking things in his way. One day, as yashOdha was working in the kitchen and krishNa joined her. 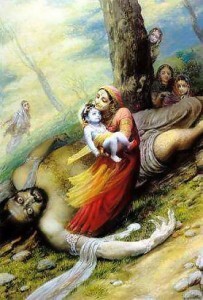 Seeing krishNa, she lifted him and was playing with him. In order to do some work, she put him down in the backyard for a moment. At that same moment, it started raining heavily with the wind blowing. Yashoda came hurrying back, to take krishNa inside, but before she returned, a very strong wind, shaped like a funnel blew and took krishNa in it. yashOdha cried out loud that a tornado had taken krishNa away. Make the puzzle below to see how krishNa was carried away by a tornado! This asura, named tirNAvartha, carried krishNa to the upper layers of the atmosphere. 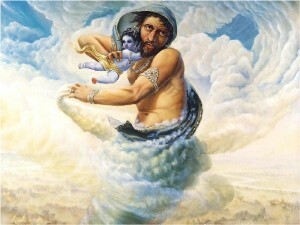 His plan was to go very far away into the sky and then throw krishNa down to earth and end krishNa. As triNAvartha went higher and higher, he felt a bit breathless. The breathlessness kept increasing and he also found krishNa to be heavier. It seemed as though krishNa was growing bigger and heavier and the hands of krishNa were strangling tirNAvartha. 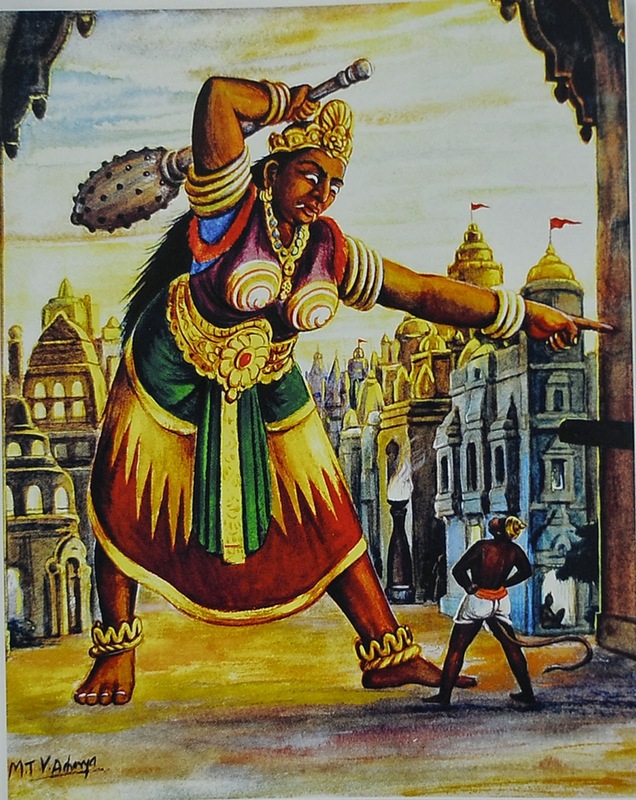 In no time triNAvartha could no longer breathe and dropped dead, heavily near gOkula. The search party in gOkula heard this very loud thud and came towards the source of the sound. There! They found krishNa happily laughing and playing on this asura. Make the puzzle below to see the scene described above. As krishNa was growing up, there were more asuras that kamsa kept sending. aghAsura was an asura who took the form of a snake. 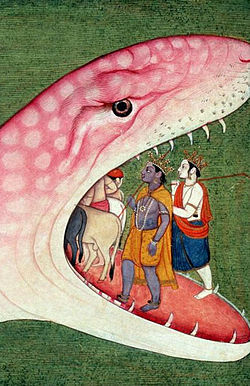 aghAsura’s idea was to lure krishNa and his friends by keeping his mouth open wide. Once inside, aghAsura could just close his mouth and digest the kids, along with krishNa. aghAsura conveniently took his place in an area within the dense forest, where kids would always come exploring. As aghAsura expected krishNa’s friends wandered inside and stayed exploring aghAsura’s internal parts for a long time. krishNa looked for his friends for a long time and then came into aghAsura’s mouth too. Once krishNa went inside a bit, aghAsura closed his mouth and everything became dark. 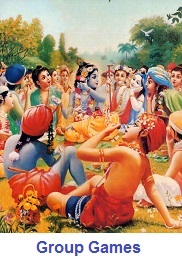 krishNa understood what was going on and appeased his scared friends. Eventually, krishNa punched through aghAsura’s skin and saved his friend. Make the puzzle below to see how aghAsura was. Here AndAL recalls the incident of krishNa splitting open the crane’s beak, as one of the greatest acts of krishNa as a child. 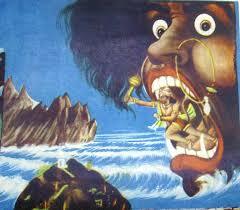 The story goes that bakAsura stayed on the banks of river yamuna and swallowed krishNa along with his friends. krishNa, once inside krishNa burnt the heart of bakAsura. 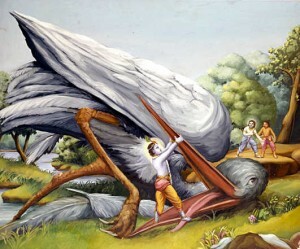 Unable to bear the heat, bakAsura spit krishNa out and try to win over him, with his beaks. Seeing that bakAsura was not going to stop his fight against him, krishNa splits up the beak of bakAsura and finishes him. Make the puzzle below to see bakAsura. 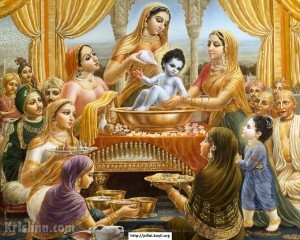 Let us enjoy more stories of krishNa’s childhood in the next posts. This entry was posted in Jigsaw Puzzles, Puzzles, Stories on September 14, 2014 by mayuravalli. This entry was posted in Jigsaw Puzzles, Puzzles on September 1, 2014 by mayuravalli. 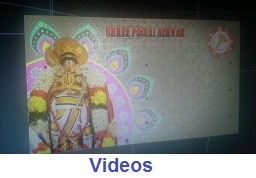 ஒத்திட்டிருந்தவா காணீரே ஒண்ணுதலீர் வந்து காணீரே. periyAzhvAr is inviting everyone to come see the soft and beautiful krishna, whose 9 toes denotes the 9 different gems, also called navarathnams, and then 10th toe is coated with gold. 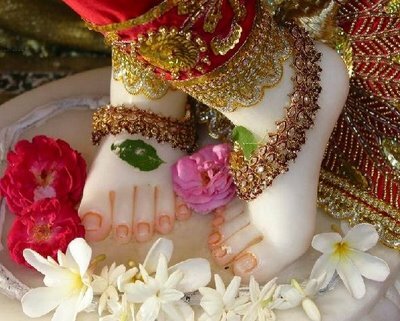 periyAzhvAr is comparing the toes of krishNa to the marudhANi (henna/mehendi designs) that people use to decorate hands and feet and is saying that krIshNa is perfect in every way, inviting everyone to enjoy him, in his beautiful cradle. 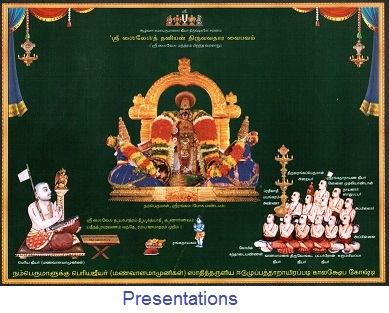 krIshNa was not only celebrated by people in gOkula, but also blessed by the many different Gods, as described in the mANikkam katti padhigam, sung by periyAzhvAr. 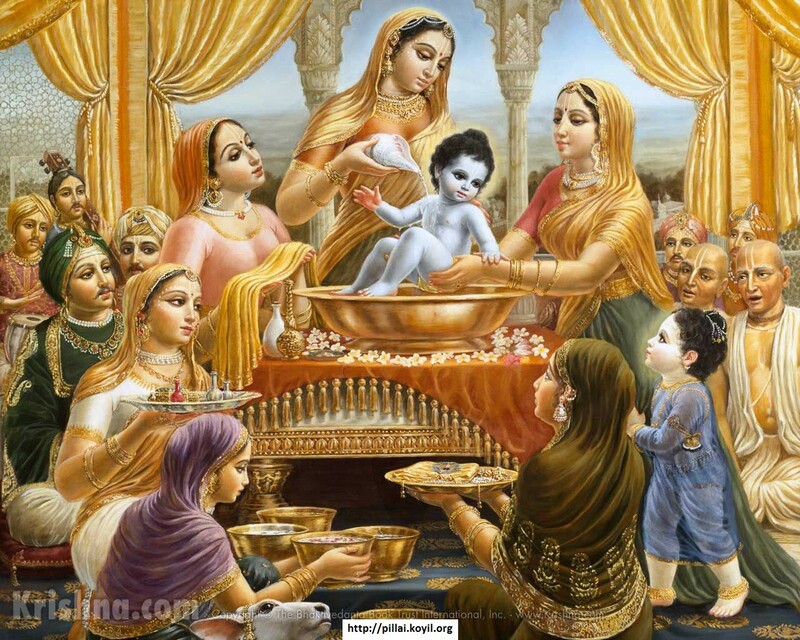 While krIshNa was celebrated in gOkula, kamsa was still very frightened for himself and decided to end the life of all the children born in the past 2 weeks, around the time krIshNa was born. kamsa started to gather his evil forces and sent them in all directions. One such evil force was pUthana. pUthana was a female asura who would turn herself into a beautiful damsel and try to feed krishNa with poisoned milk, smeared on her breasts. Make the puzzle below to see how beautiful pUthana was when she tried to attract the kids to herself. This beautiful pUthana, took away krIshNa and started feeding him milk. krishNa, the all knowing sarvEshwaran not only sucked the milk from pUthana, but also her life, mainly because pUthana came all the way to gOkula, just to give krishNa something. krishNa has the power of knowing what was in pUthana’s heart and therefore, took everything that pUthana could offer – that is her life! Make the puzzle below to see the final form of pUthana and how she was taken by krishNa. Meaning, krishNa completely sucked out pUthana’s life, without a second thought or giving her an opportunity to escape. Even though kamsa knew that nandhagOpa’s son krishNa was causing some mischief and had killed pUthana, kamsa kept sending more asuras, hoping that one of the asurAs could overpower this mere kid. The next in line was chakatAsura. chakatAsura came over to gOkula, changed himself into a wheel and hid near krishNa’s cradle. 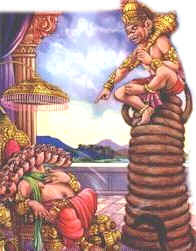 chakatAsura’s plan was to topple over krishNa’s cradle and crush him with his own wheel form. However, all krishNa did was to kick chakatAsura to end him. Make the puzzle below to see how krishNa kicked chakatAsura and won over him. AndAL pirAtti praises the greatness of krishNa’s lotus feet in this pAsuram and quotes chakatAsura vadham, saying, the greatness of krishNa’s feet is such that, the mere touch, a small kick of the kid krishNa resulted in the mOksham of chakatAsura! We will continue enjoying krishNa’s childhood in the upcoming posts. This entry was posted in Jigsaw Puzzles, Puzzles, Stories on August 31, 2014 by mayuravalli. This entry was posted in Jigsaw Puzzles, Puzzles, Stories on August 19, 2014 by Sarathy Thothathri. krishNa, one of the pUrNa avatArAs of sriman nArayaNa, took the form of a human to show one of HIS greatest qualities – saulabhyam, the ability to mingle with everyone as an equal and being most easily approachable. As krishNa janmAshtami is being celebrated in the northern parts of bhAratha dhEsam, let us enjoy the story of the birth of krishNa. There was a time in dwApara yuga, in the city of mathurA, where the yAdhava clan was thriving and there was a prince called kamsa, who then became the king of the yAdhavas. kamsa had a cousin dhEvaki, who was married to vasudhEva, another prince in the yAdhava clan. On the day dhEvaki and vasudhEva were married, there was voice from the sky which prophesied that dhEvaki’s 8th son would be the destroyer of kamsa. On hearing this kamsa was about to kill dhEvaki. Please make the puzzle below to see how angry kamsa became! 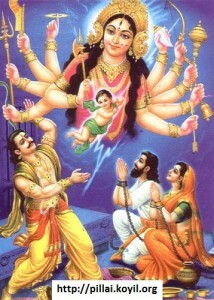 vasudhEva pleaded with kamsa to spare dhEvaki’s life and assured kamsa that both dEvaki and vasudhEva would give away all of their children to kamsa, as soon as they were born. 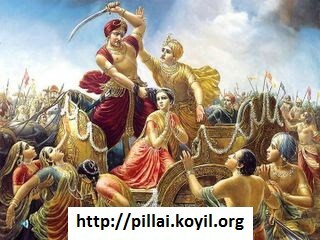 vasudEvA pleaded saying that dhEvaki and he are not responsible for kamsa’s death and killing a woman would result in more sins for kamsa. kamsa also imprisoned vasudEvA and dEvaki in jail, in order to monitor all their activity. Thus, dhEvaki and vasudhEva kept having children and as soon as a child was born, kamsa would come to the prison and take the child away. As days passed, dhEvaki and vasudhEva would lament at the plight of their children, even before they were born. Unable to see their suffering, srIman nArAyaNa came in their dreams one day, before the 8th child was born and said that he would be born as the 8th child and gave them a set of instructions. The instructions were for vasudhEva to carry the 8th child to the house of his friend, the cowherd chief nandhagOpa in gOkula right after his birth, where nandhagOpa’s wife yasOdhA would birth to a daughter, at around the same time. The baby boy and girl were supposed to be exchanged. dhEvaki and vasudhEva were anxiously waiting for the birth for srIman nArAyaNa and in the month of AvaNi, the star of rOhiNi, in the thithi of ashtami, srIman nArAyaNa incarnated as krishNa! As soon as the baby was born, the doors of the jail magically opened to let vasudhEva through, so that he may take krishNa to gOkula, per the instructions. The river yamunA lay between the cities of mathurA and gOkula. As is the color of krishNa, there were dark rain bearing clouds when krishNa was born and as vasudhEva started to take him out, the rains became heavier, such that no one could see what was going on. 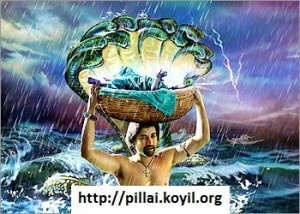 In this heavy rain, vasudhEva had to cross the majestic river yamuna in order to reach gOkula. As vasudhEva was crossing the river yamunA, the river also started to over flow with water and it is believed that yamunA flooded in order to be able to touch the feet of little krishNa, as he lay on as basked carried on vasudhEva’s head. As vasudhEva was in jail and had no other possessions, adisEshA, the bed, throne, seat and umbrella of emperumAn came and hovered over vasudhEva’s head, protecting our small krishNa from the heavy rains. Complete the puzzle below to see the greatness of adisEshA and how vasudhEva crossed the raging river yamuna. After reaching gOkula, vasudhEva entered the home of nandhagOpan and yasOdhA and replaced the baby girl lying there with krishNa and brought back the baby girl to Mathura. As soon as vasudhEva returned to the prison, the prison doors started locking back up. When vasudhEva was tucked back in safely, the baby girl started crying, awakening the guards, who in turn let kamsa know about the birth of the 8th child. kamsa immediately rushed to the prison and was shocked to see that the 8th child was a girl and was almost sure that a baby girl could do nothing to him. kamsa was about to kill this baby girl too, but as he was about to do that, the baby girl flew out of his hand and became – yOga mAyA, with 8 hands. She laughed at kamsa and said that kamsa would gain nothing by trying to kill her and instead the one destined to kill kamsa, dhEvaki’s 8th child is elsewhere and vanished. Complete the puzzle below to see how yOga mAyA looks and the shocked look of kamsa. While kamsa was shocked and furious at having been fooled, in spite of locking dhEvaki and vasudhEva, the people of gOkula rejoiced the birth of krishNa! The joyous people of gOkula went to the palace where kutti kaNNan (baby krishNa) was “born” amidst them. They sprayed scented powder and fragrant oil on each other to celebrate the arrival of their darling and were happily celebrating that krishNa was born! Complete the puzzle below to imagine some of the celebrations in gOkula. 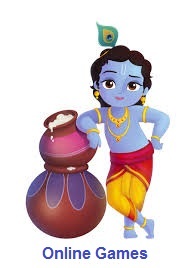 In the upcoming posts, we can enjoy the childhood of krishNa and many of his pass times. This entry was posted in Jigsaw Puzzles, Puzzles, Stories on August 16, 2014 by mayuravalli. This entry was posted in Jigsaw Puzzles, Puzzles on July 28, 2014 by mayuravalli. 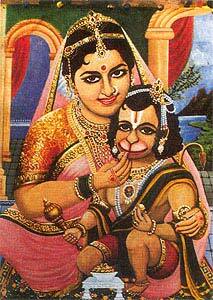 hanumAn (thiruvadi) returns to srI rAmA and conveys the message about where sItA pirAtti is kept hidden. hanumAn (thiruvadi), also brings the chUdAmaNi (head ornament) that sItA pirAtti sent to be shown to srI rAmA. Finish the puzzle below to see the devout hanumAn return the chUdAmaNi and get the blessing of srI rAmA. 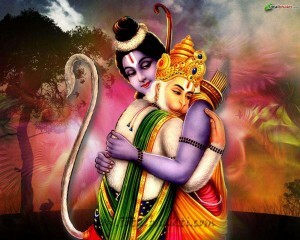 srI rAmA is extremely pleased with tiruvadi’s devotion and hugs him for bringing back promising news about sItA pirAtti. Make the puzzle below that captures the famour rAmA Alinganam, the wonderful hug given by srI rAmA, that hanumAn cherishes to this day. So great is the devotion of hanumAn (tiruvadi), that even today hanumAn is supposed to be present at any place where srI rAmAyaNam is recited or discussed. 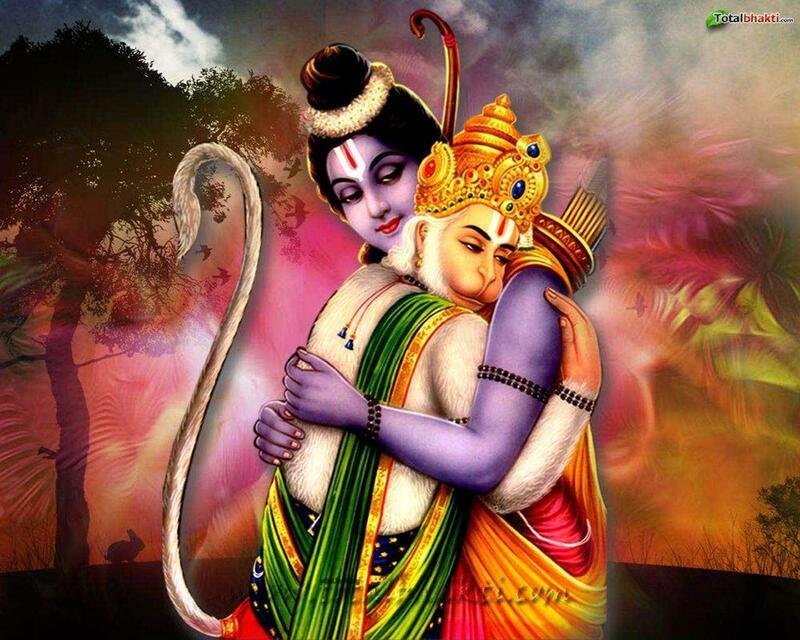 Like hanumAn, let us also keep srI rAmA, sItA, lakshmaNA in our hearts forever. bolO sItA rAm ki jai! After crossing the ocean, hanumAn lands in lankA and meets lankiNI, at the entrance of Lanka, where sItA pirAtti appears to be hidden by rAvaNA. 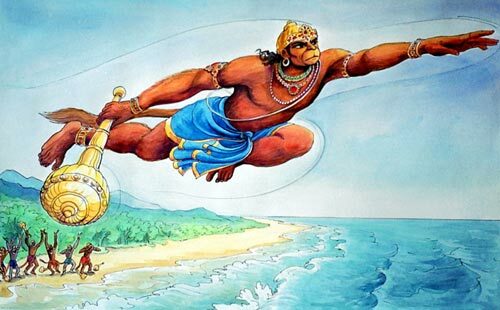 hanumAn wins over lankiNI and then searches for sItA pirAtti all over lankA. 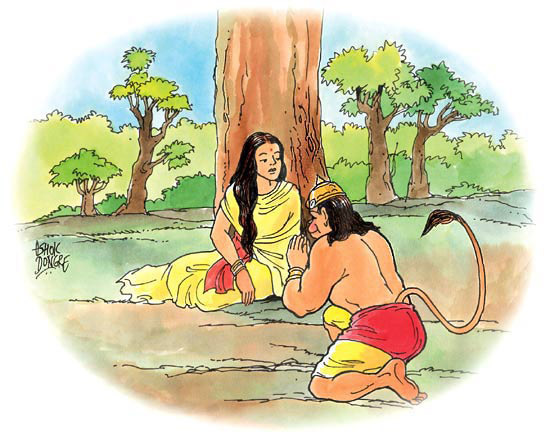 After a lot of searching, hanumAN finds sItA pirAtti in a garden called ashOka vanam, in great sorrow, under a tree. hanumAn perches himself upon a branch above the trees that sItA pirAtti is sitting on and starts reciting the entire story of rAmA until the time of sItA’s adbduction, so that sItA pirAtti can trust hanumAn. sItA pirAtti is then intrigued and starts talking to hanumAn, asking about how srI rAmA is. 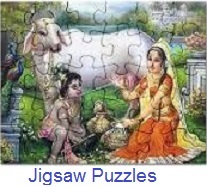 See the puzzle below to see the discussion between sItA pirAtti and hanumAn. After exchanging all that has been happening with srI rAmA, hanumAn is about to leave lankA, but gets captured by rAvanA’s people and is taken to rAvaNA’s palace. hanumAn challenges rAvaNA, who sets fire to hanumAn’s tail. Make the puzzles below to see how hanumAn sits in rAvanA’s durbAr and what hanumAn does when his tail is set on fire. Thinking hanumAn is arrogant, rAvaNA sets fire to hanumAn’s tail! hanumAn burns lankA down with his tail on fire! This entry was posted in Jigsaw Puzzles, Puzzles and tagged hanuman, jigsaw, rama, sita on July 28, 2014 by mayuravalli. hanumAn, one of the most important characters of srI rAmAyaNA met srI rAmA and srI lakshmanA, after rAvaNA kidnapped sItA pirAtti. srI rAmA and lakshmaNA are wandering around the forest in search of sItA piratti and happen to come across hanumAn. Put the puzzle together, to see the meeting of hanumAn and rAma-lakshmaNA. 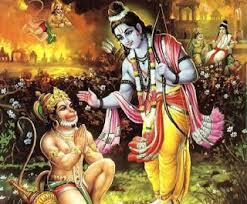 hanumAn becomes friends with rAmA and lakshmaNA and also introduces them to his king, sugrIvA. With the help of the monkey king sugrIvA, rAmA arranges search parties for finding sItA pirAtti. 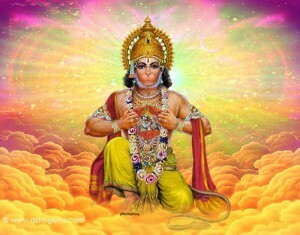 hanumAn is the head of the search party that heads in the Southern direction. After reaching the Southern ocean shores, the monkeys realize that someone has to cross the ocean to see if sItA pirAtti is on the other side. 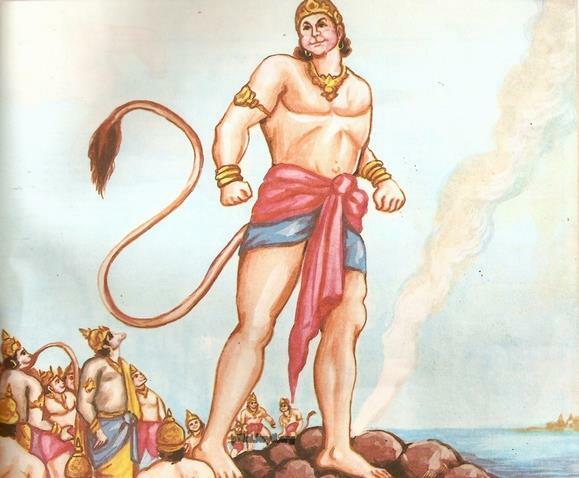 jAmbavAn, another mighty monkey decides to reveal hanumAn’s powers (the one hidden by the curse of the rishIs) and tells hanumAn that he can grow bigger, in order to be able to cross the ocean. Make the puzzle below to see how hanumAn grows bigger! 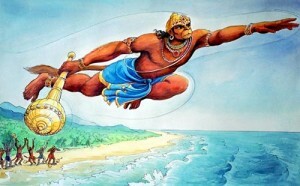 hanumAn flies across the ocean, with the monkeys bidding him adieu. And crosses the ocean, facing many hurdles. See one of the hurdles faced by hanumAn, by finishing this puzzle. This entry was posted in Jigsaw Puzzles, Puzzles and tagged hanuman, jigsaw, rama on July 28, 2014 by mayuravalli. 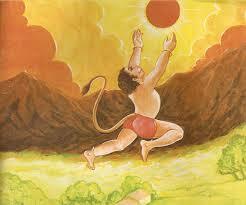 hanumAn was a very powerful, gifted and mischievous child. hanumAn was known to tease the rishIs while they were in meditation and once hanumAn flew to the sun, thinking it was a fruit. 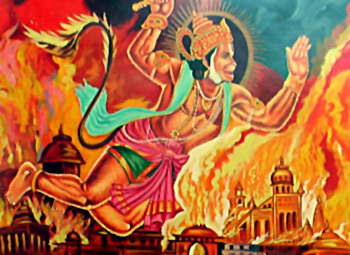 After this incident, the rishIs cursed hanumAn slightly, such that hanumAN would forget how powerful he was. Make the puzzle below that captures hanumAn reaching out to the sun. This entry was posted in Jigsaw Puzzles, Puzzles on July 23, 2014 by mayuravalli.